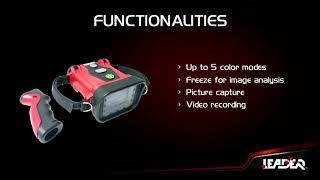 The charge base recharges all the following LEADER thermal imaging cameras: TIC 3.1, TIC 3.3, TIC 4.1 and TIC 4.3. The base can be used to connect cameras mounted with or without a pistol grip. 4 batteries can be recharged simultaneously (2 in the camera + 2 on dedicated pads). The advantage of charging the batteries in the camera is that it is ready to go on the field. Faster charging than with mains charger: Only 1h30 is needed to charge 100% the LEADER LiFePO4 batteries! Leader TIC 3 and Leader TIC 4 thermal imaging cameras can all be recharged on the charge cradle. This one can be mounted in a vehicle (12-24V) or mains (110-240V). It charges LiFePO4 rechargeable batteries in the camera in a minimum of time without having to remove them, same time it charges 2 extra batteries on 2 dedicated pads out of the camera.